My kids have been getting into Scooby Doo the past few weeks. 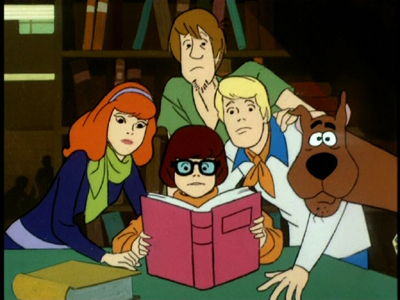 Scooby Doo has a very interesting color palette. It's so stylized that it's even noticeable to someone like me, a novice at color management. The backgrounds are always dark, either grey or blue. They feel cold. The sun never comes out. There are no natural shadows. The only bright colors are the main characters, who dress in shades of orange, red, and blue. Daphne's hair in particular has orange star power. In photographic terms, the effect looks cross-processed. I guess the thinking behind all of this was to make the cartoon more scary, Halloween-like. Since the plots usually involve crime-solving, ghosts, mystery, etc., the sets needed to be dark and creepy. Before my kids watched Scooby Doo I'd never so clearly noticed how the use of color can lend a very specific feeling to a scene.